Dale L. Augerson, CCS, born Jan. 25, 1918, Altona, IL, graduated high school and from the American Institute of Baking. 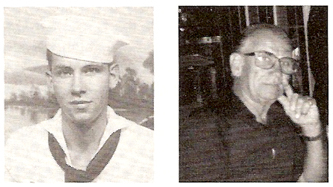 He enlisted in the USN Sept. 10, 1940, and after training boarded the USS West Virginia in Bremerton, WA. On Dec. 7, 1941, Augerson was the only baker on duty and heard the announcement on the PA system, "This is general quarters." A short time later bullets were ricocheting off the boat deck. He headed for cover and was knocked out by a large bomb from the deck above. He regained consciousness 12 hours later at Red Hill Hospital. He reported to the bakery at the receiving station where they were feeding 25,000 daily for some time. Later Augerson helped commission the carrier, USS Windham Bay, as head baker. Memorable experience was leaving Italy with troops on Gen. M.B. Stewart and receiving news in the Atlantic that V-J Day had happened and to head straight to New York. They were the second ship in and were greeted with tugs spraying and small craft loaded with lovely girls, all dancing to upbeat music. Everyone headed to starboard side and the captain had to call general quarters to right the ship on its keel. He was discharged Nov. 20, 1946, and received all the usual medals (7 in all). He lives with his wife Betty in Altona, IL. They have two boys, Scott and Sean, and six grandchildren. Reprinted with permission from Turner Publishing.